bl.uk > Online Gallery Home	> Online exhibitions	> Asia, Pacific and Africa Collections	> Chándá Walls. 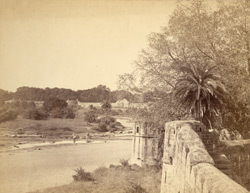 Photographer: Ritter, Molkenteller and Company, R.
Photograph of Chándá Walls. Taken in the 1870s by Ritter, Molkenteller & Co., this print is from an album entitled 'Views in India and Bangladesh', part of the Temple Collection. Text accompanying the photograph reads, 'The bastion in the foreground is one out of the 46 bastions which occur at intervals along the Chándá City walls. These walls are about 7½ miles in circumference. The overhanging foliage consists chiefly of tamarind trees. The stream in the foreground is the Jharpat river, which washes the Chándá walls for about two miles and then flows into the Virai'.